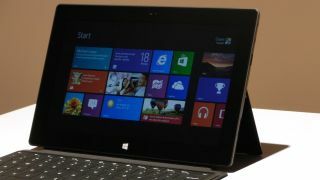 Are you tempted by one of Microsoft's Surface Windows 8 tablets? It's the weekend, which means it's time for cups of tea, cream cakes and the TechRadar reviews round-up! It's a surprise that Microsoft created its own tablet, but it's done a more than decent job of it; far more creative and polished than many Android tablets. Microsoft has to get the price right – the current thinking is comparable with iPad and 10-inch Android tablets for Surface RT rather than with the 7-inch Kindle Fire – and battery life has to be good too. The next stage is convincing the world that Windows 8 is a comparable tablet OS to iOS and Android, and making it competitive on cost too. But the first move is a good one – giving choice, an excellent array of hardware and a well-designed tablet range to those that are still unsure whether the current crop of slates can match their needs. It also sends a message to Microsoft's hardware partners: this is the standard for Windows 8 tablets should adhere to, unless you're going to get seriously competitive on price. The form and size of the Samsung Galaxy Tab 7.7 feels perfect for a device you can grab to take with you for a long trip, a meeting, or a trip to the ballpark. It isn't as unwieldy as a 10-inch tablet, but the tradeoff is the screen loses real estate previously devoted to input. As a result, it doesn't feel like a serious business device (unless you pair it with a keyboard) that you would want by your side through a busy day of meetings and projects. What you're left with is a very pretty, functional, and expensive media device. Android fans should consider this device if it fits their needs, but with other more attractive options in similar price ranges, you'll want to take a hard look at those needs and decide if it actually works for what you need it to do. For a casual camera and entertainment unit, it works well. Any more than that, and you're going to find the capabilities stretched very thin. The Sony 32HX753 arrives on the back of a startlingly brilliant start to 2012 from Sony with its HX853 range of TVs. Perhaps because of this, first impressions of the cheaper 32-inch television are underwhelming, thanks to its reduced build quality and rather muted pictures. But it's not really fair to compare the Sony 32HX753 to those illustrious televisions. Versus similarly priced 32-inch TVs it's pretty good, provided you accept that you have to be careful with setting it up if you want to get anything like the best out of it. Overall, though, we couldn't help but think that both its 3D talents and the way its ideal picture settings seemed aimed at the enthusiast rather than casual market would have been better suited to a larger screen size than 32 inches. The HTC Desire C is better than the handsets it's come in to replace, but not by much. The intuitive interface, attractive design and competitive price tag means the Desire C certainly has the opportunity to do well at the low end of the market – especially against the likes of the Samsung Galaxy Y and LG Optimus L3. But for those who need a little more bang for their buck, you might want to see what the Ascend G300 or BlackBerry Curve 9320 have to offer. While we prepared words which would ridicule the Xonar Phoebus for being an overpriced cash in on so called 'audiophiles' lack of financial nous, we're now prepared to hear those same sentences played back endlessly in a repeating loop of crystal clear quality for the rest of eternity. Preferably read by Derek Jacob over the sound of hollow laughter. This is, possibly, the best sound card out there at the moment.